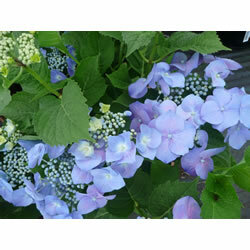 Lace Cap Hydrangea. 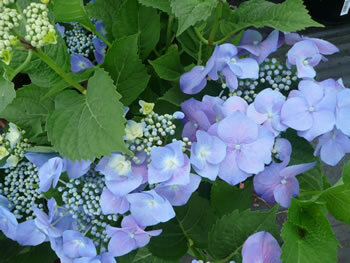 Attractive large flattened heads of lilac-blue flowers. Max Height: 1.2m. Max Spread: 1.2m. Flowers: July to September. Full sun/partial shade. Hardy. Back-fill with soil mixed with peat substitute and a suitable fertiliser.